Please note: Last entry into St Andrews Aquarium is ONE hour before closing time. WHEELCHAIR ACCESS: As a Victorian building on the cliff edge our building is not accessible to all, please contact our reception team to discuss your requirements – for more information see Accessibility Information below. The nearest car park is located 100 yards away from our front door. Bruce Embankment car park is operated by Fife Council, has over 150 spaces available with seasonal charges between 1st April and 30th September. If using Sat Nav to locate the car park please enter KY16 9AB. Other car parks are available slightly further away and during peak season, these can be busy. Currently there is no wheelchair access available due to ongoing construction work on the building which is temporarily blocking the wheelchair ramp access to the building. We apologise for this inconvenience and will update this page as soon as wheelchair access is safely restored. Registered assistance dogs are very welcome in our aquarium, public reception, Café and gift shop areas as well as the public toilets (please be aware that the café, gift shop and toilets are all accessed by stairs). Unfortunately, we don’t have a kennel facility on site at the moment. Our cafe has been completely refurbished over the winter and is looking amazing. It is open every day serving delicious coffee, tea and tasty treats. With some of the best views in St Andrews overlooking the West Sands and Steprock Beach, its easy to see why our light and airy cafe is the perfect place to relax. Steprock Cafe is available for private hire & birthday parties. Steprock Events at St. Andrews Aquarium offers a completely unique venue that will create a lasting effect with your guests. We have hosted many different types of events over the years including business mixers, corporate hospitality and student parties so why not get in touch to see what we can offer. Situated next to the main entrance, our marine themed gift shop is the perfect place to start and end your day at the Aquarium. There’s an exciting range of educational products and gifts on sale to remember your visit by. So whether it’s a cuddly meerkats, perfect penguins or fabulous fish you’re looking for, we’ve got it covered. 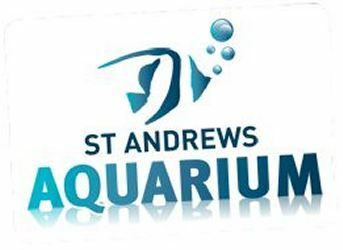 St Andrews Aquarium offers a unique and exciting learning opportunity for students of all ages and abilities while integrating conservation into the national curriculum in a fun and engaging manner. Coming face to face with some of the most beautiful, fascinating and dangerous creatures from the watery Worlds, students will be transported into a World of adventure. From native sharks to seahorses, lobsters to lionfish, poison dart frogs to piranhas…… and not to forget our loveable seals and family of meerkats. We guarantee you a day not to forget. Please get in touch to discuss prices, packages and options for your trip.